Size of the compressor: 16.1" x 6.9" x 12.3"
The Silentaire 20-A airbrush compressor is a perfect choice for airbrush artists who need to use two brushes simultaneously. That helps to finish the work faster than you planned. Also, this compressor is so quiet that it won't bother you during the painting and you can concentrate on your hobby. Besides, the compressor includes the in-line regulator with the moisture trap that serves to protect the device from overheat and corrosion. The regulator controls the level of pressure and activates when it increases to the set limit. This provides a long-term use of the mechanism. Additionally, the carrying handle guarantees a convenient transporting anywhere. Thus, you can take the Silentaire 20-A airbrush compressor to any place and focus on your artwork. 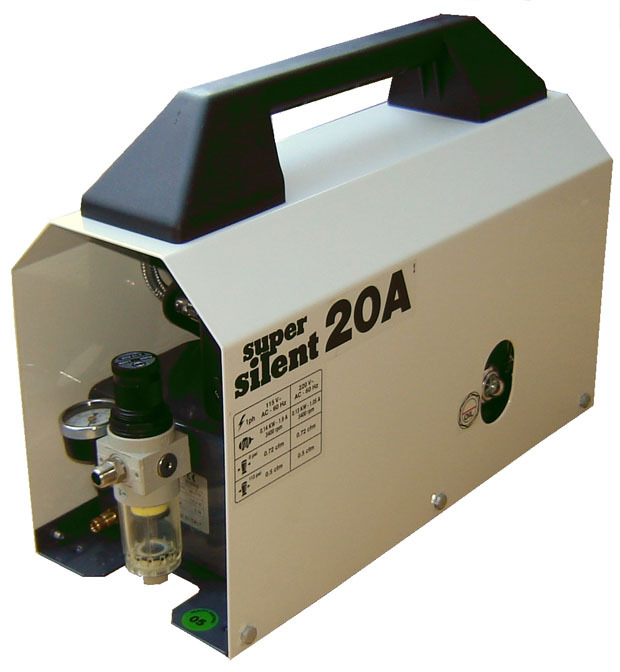 At first, the Silentaire 20-A air compressor is completely automatic. The item includes the tank, the in-line regulator with moisture trap, the safety valve, and the air intake filter. Moreover, it has a handle for easy carrying. In-line regulator serves to reduce input pressure in one step. The excess amount of pressure may cause damage to the tool or its parts. The pressure regulator helps to avoid this. The moisture trap prevents high humidity that can lead to musty smell, mold, vermin or corrosion. The moisture trap keeps a state of the components and maintains the operability. The safety valve automatically activates when inner pressure increases. Then the valve opens and releases excess fluid from the tank. After this, the safety valve closes preventing further moisture appearance. Secondly, the Silentaire 20-A compressor is super silent. 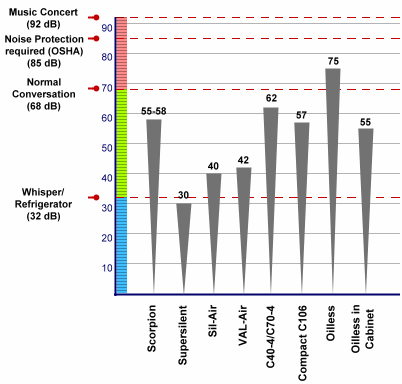 The noise level is 30 Decibels that two times quieter than normal conversation noise level. As a result, the compressor won't disturb your hearing and annoy you. Our noiseless airbrush compressor is perfect for those who love to work in silence. And finally, the 20-A compressor is compact enough for easy transport. Thus, you can take this device anywhere.